The average age of a local councillor after previous elections has been just over 60, according to Local Government Association research. But for 2018's poll, some young people are bucking the demographic and standing to represent their local area. BBC News spoke to four young candidates from different parties about their experiences up to polling day. As they knock on doors on the campaign trail, all four of them report being met with the same comment - expressions of "You look young!" follow them from house to house. 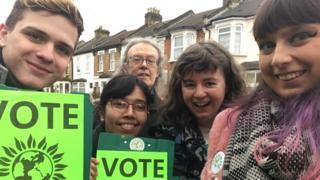 But Frankie-Rose Taylor, a 25-year-old Green Party candidate in Newham, says people tell her they are glad someone born and bred in the borough is standing for its council. "I'm part of this community," she says. In contrast, 23-year-old Josh Abey, standing for Labour in Enfield, reports that it has not all been plain-sailing. He has been met with "a raised eyebrow" and a few "negative comments" he says, mostly consisting of voters expressing doubts that he has enough experience to do the job. "This can be disconcerting and jarring," he says, but he has a response prepared: "My line is that I have lots of energy for case work." Conservative candidate Nida Hassan, 31, says people recognise her passion. She says having a five-year-old son, helps her to relate to people's concerns about her city, Worcester. In fact, she describes the response from the public to her age as overwhelmingly positive. When one of her campaigners told a local resident that the candidate was a young woman, she says it met with a celebrity-style reaction of: "Can I meet her?" Nida was promptly hurried over to the woman's house. For Josh and Frankie-Rose, age itself was an incentive to run. "Scrolling through candidates," says Josh, "it's very hard to see a face that looks under 30 - or even under 50. It's an easier thing to do if you're retired and have time, but I wanted to give young people a voice." "It's about representation," Frankie-Rose says, emphatically. All three of the London candidates - Josh, Frankie-Rose and Will Dyer, standing for the Liberal Democrats in Tower Hamlets - say the housing shortage has propelled them into politics. "The housing crisis affects young people more than anyone else," Josh says. adding he wants "innovative solutions" for social and affordable housing in Enfield. "My pledge is to crack down on bad landlords - name and shame", he says. "Councils are key" to solving the problem, he adds. His words are echoed by Will, who says young people can "spearhead change" both in campaigns and in councils which have had the same policies for years. Frankie-Rose also mentions housing as the most pressing concern for her peers. After years of "shouting at the TV" she joined the Greens three years ago because she felt "they were the only party with new ideas". Will moved to London after graduating from university, he is not from the area he hopes to represent. Nevertheless, he says growing up in the "small town of Reigate, community was everything" and that experience has motivated him to care about community where he is now. He jokes that he has also been spurred on by convincing his mum to join the Liberal Democrats, but says that, ultimately, "it's about helping". For Nida, who is standing outside of London, housing problems are less acute, but she still expresses frustration with "councillors who have been there forever". She believes the quality of local services has fallen but nothing has been done. She is particularly concerned about anti-social behaviour, which she says is on the rise in Worcester city centre, and criticises the council for not spending money allocated for new CCTV cameras. She's running, she says, because: "I want to want my children to grow up here."